This Saturday (April 28th) there is a children's bike helmet giveaway at Fairway market in Stamford from 9am to 1pm. It's an annual event that was first created been organized by retired police officer Glenn Coppola and his wife Peggy in memory of their son who was hit by a car riding his bike in 1992. I hope you let your own kids and your friends who have kids know about this if they don't have helmets. Now I know that a lot of adults ride around without helmets and say they're fine not wearing them, but that's not how precaution works. It's all about the prefix, 'pre.' We don't have metal detectors at the airport with signs over them that read: 'All Terrorists Must Pass Through Here Before Boarding Plane' because we don't know where the danger is: everyone has to pass through the detector just like everyone should wear a helmet - if for no other reason than it gives you a place to mount your rearview mirror. By now you may have noticed the watermelon. Let me explain. I wanted to see if there was a way to demonstrate the importance of helmets. 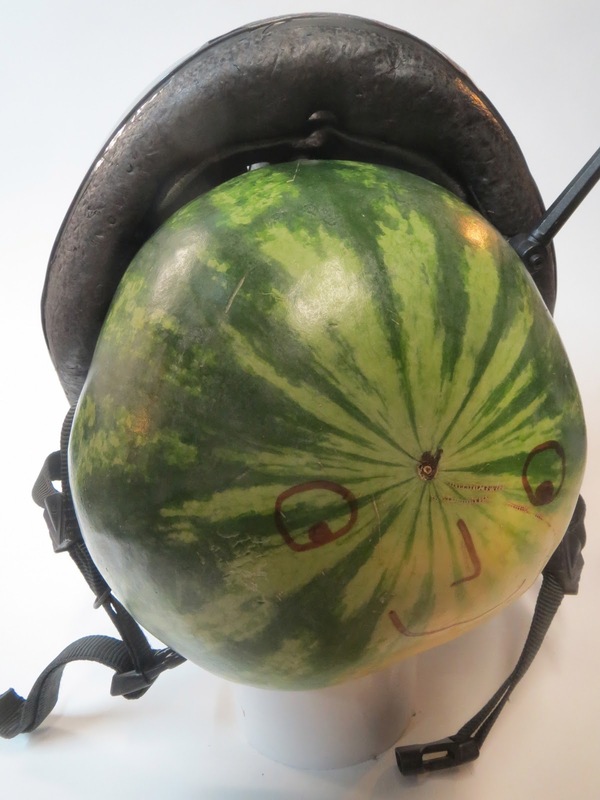 I selected an old helmet I don't use anymore, then I settled on small, seedless watermelons. 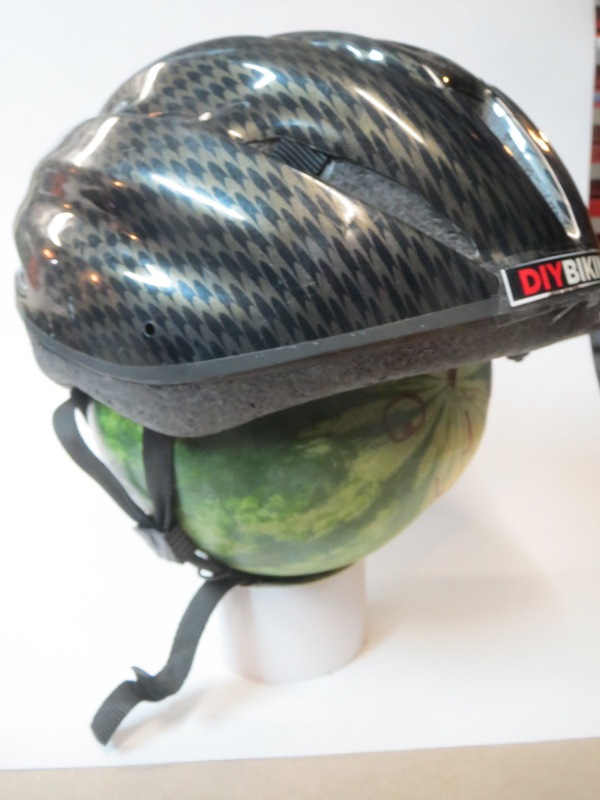 If you ever try this, you'll have to bring your helmet into the grocery store with you to…you know…check the fit of each watermelon to make sure it'll go in the helmet okay. If other shoppers back up several feet from you while you're doing this, ignore them. Now the first thing I did with the first of two watermelons that made the cut of my little fashion show is set one up to illustrate the proper way to wear a helmet: straight and true on the very top of your head and the straps underneath your chin: not too tight but not too loose, either. You don't want to wear the helmet on the back of your head: too many kids I see out there look like the photo below - except kids are not watermelons. The next thing I did was built a little diving platform in the basement workshop (still a terrible mess since the Kitchen Undertaking continues) where a watermelon could fall from: 68.5" from the welding room floor. I immediately regretted not bringing a clean fork into the shop before I started this. 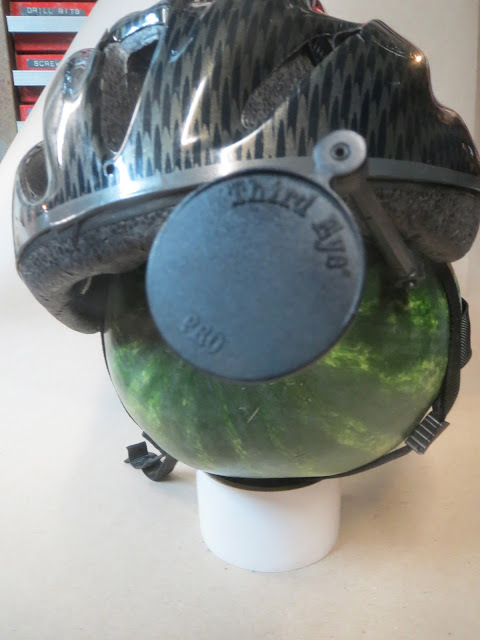 Next, I reached for my old bike helmet and strapped the second watermelon in. Holding it at the height of 68.5" I let it fall. The top of the helmet, which took the full force of the impact, had shattered. I turned the helmet around apprehensively and looked at my results. There wasn't even a trace of liquid in the shower cap and the melon/human head stand-in was completely intact, save for a small gash on top. Still, it wasn't nearly as catastrophic as the helmet-less melon's experience. The helmet itself, on closer inspection, was a total loss: not only did the plastic top shatter, but there was a big crack in the foam. In other words, the helmet did its job in that it took the force of the fall - and needed to be discarded. Be sure to do the same if you ever damage your helmet. So there are two lessons we can draw here: if you want to help protect your head from impact wear a helmet and wear it properly. 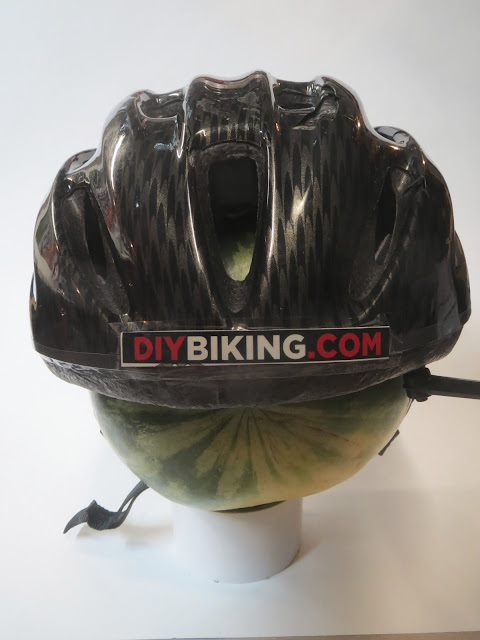 The other lesson is that helmet manufacturers should diversify and sell melon protection kits to keep watermelons safe when picnicking in rocky areas. Also, if your own helmet needs are covered and you want to help someone else's, you can support the helmet drive by sending check to the Timothy Coppola Memorial Helmet Giveaway and mail to the Stamford Police Association, 805 Bedford St, Stamford CT, 06902. And the nearby Pacific Swim Bike Run is having a sale this same week if you want to make a stop for other cycling supplies. Hope I see you at both. Thanks for reading and thanks for riding.